A4NH is excited to be part of next week's inaugural Agriculture, Nutrition & Health (ANH) Academy Week to be held in Addis Ababa, from 20-24 June. All are welcome on Friday, February 12, 2016 from 10:30 to 12:30 GMT (London time) to join a consultative webinar organised by the Agriculture, Nutrition and Health (ANH) Academy Working Group on Sustainable Diets. The group will present their work on methods and metrics of sustainable diets and will seek feedback from the research community. Calling all agriculture, nutrition, and health researchers! 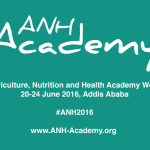 Announcing the inaugural Agriculture, Nutrition & Health (ANH) Academy Week and Conference on Agri-Health Research in Addis Ababa, Ethiopia, from 20-24 June 2016.